We had a huge miracle take place at the tomb of St. Paul. You can see it in Behind the Scenes on our DVD Paul: Contending for the Faith. This is a picture of the place St. Paul is buried to accompany this news item. Rome, Dec. 6, 2006 (CWNews.com) – An Italian archeologist has uncovered the tomb of St. Paul, underneath the altar of the Roman basilica of St. Paul-outside-the-Walls. St. Paul-outside-the-Walls was built in 390, on the site of St. Paul’s tomb. 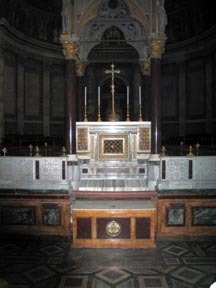 The sarcophagus was visible until the 19th century, when the basilica was destroyed by fire and rebuilt, with the new altar on top of the site where the old crypt was located. In 2002, the Vatican authorized an archeological dig to recover the tomb of St. Paul and make it available to the public for veneration. The Vatican press office has announced plans for a news conference, to be held on December 11, to discuss the renovations at the basilica. The archeologist Filippi will brief reporters, along with Cardinal Cardinal Andrea Cordero Lanza di Montezemolo, the archpriest of the basilica.